Hotel Albion is located in Ajaccio, on the west coast of Corsica. It is just a 5-minute walk from the city centre and the beach. 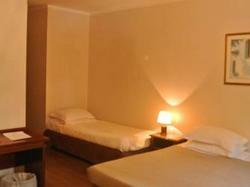 It offers air-condtioned accommodation with free Wi-Fi access. Each room at the Albion is equipped with a direct telephone and satellite TV. Some rooms also have view of the sea. A buffet breakfast is served every morning in the Albion's flowered garden. Breakfast can also be enjoyed in the lounge or in the guest rooms. The Albion is serviced by a lift and provides a 24-hour reception and a bar. Please note that this hotel is under renovations. With wooden floors, this air-conditioned room offers a TV and a private bathroom. With wooden floors, this air-conditioned room offers a TV and a private bathroom with a bath.